Published October 23rd by Bloomsbury. Goodreads Synopsis: Rudger is Amanda’s best friend. He doesn’t exist, but nobody’s perfect. Only Amanda can see her imaginary friend – until the sinister Mr Bunting arrives at Amanda’s door. Mr Bunting hunts imaginaries. Rumour says that he eats them. And he’s sniffed out Rudger. Soon Rudger is alone, and running for his imaginary life. But can a boy who isn’t there survive without a friend to dream him up? A brilliantly funny, scary and moving read from the unique imagination of A.F. Harrold, this beautiful book is astoundingly illustrated with integrated art and colour spreads by the award-winning Emily Gravett. My Review: I opened The Imaginary looking forward to a really cute story about friendship, and intending to read just the first few chapters before I did some blogging. I ended up reading the whole thing in one sitting, and getting what wasn’t quite a cute story, but a beautifully told tale full of hope, friendship, terror and adventure. Pageturner is definitely the right word to describe it: I simply couldn’t stop reading… And there was a surprise around every corner, none of which I was expecting. 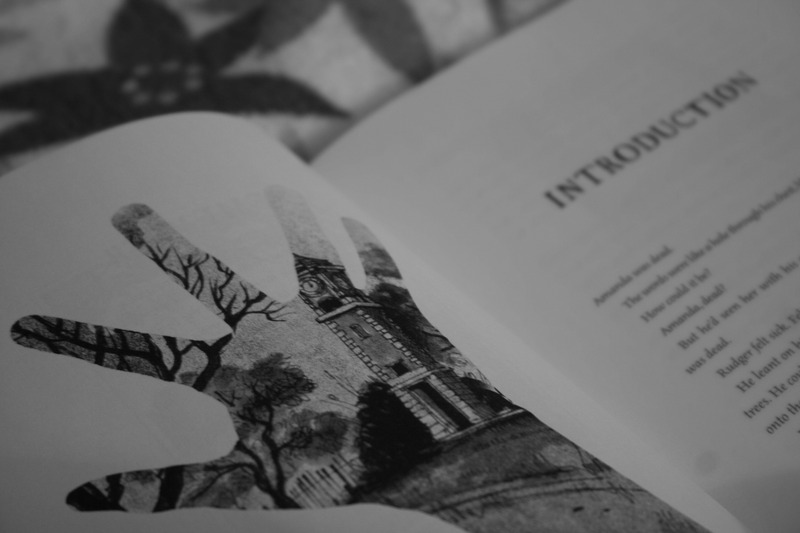 The Imaginary is marketed as an Middle Grade book, but I’m confident that teenagers and adults will fall in love with the story too – it’s got lots of crossover appeal. The plot was actually quite a bit darker than I was expecting – the antagonists were really freaky and sent shivers up my spine. However, the eerie elements of the story contrasted with the beautiful aspects of friendship and the power of imagination. The characters were perfectly crafted and realistic: Amanda and her imaginary friend, Rudger, are truly unforgettable. Amanda is such a bubbly and bright character, and her personality made me love her instantly! Rudger was everything I’d love in an imaginary friend for myself, and I was unable to put the book down, wanting to know what he did next. 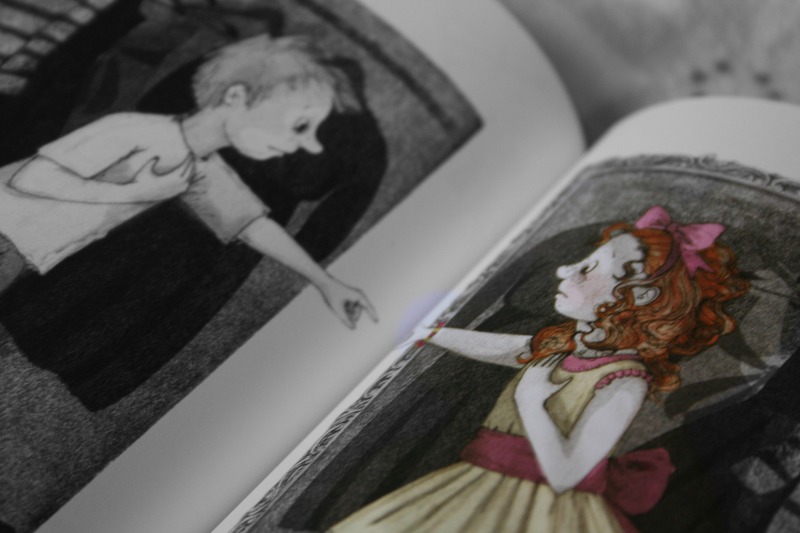 The story was captivating by itself, but Emily Gravett’s illustrations brought it to life. The character depictions were just as I would have seen them in my mind if the story wasn’t illustrated. I loved poring over the gorgeously detailed spreads. The use of Black and White versus colour was a very clever and pretty way of depicting normality/reality versus imagined worlds, too. 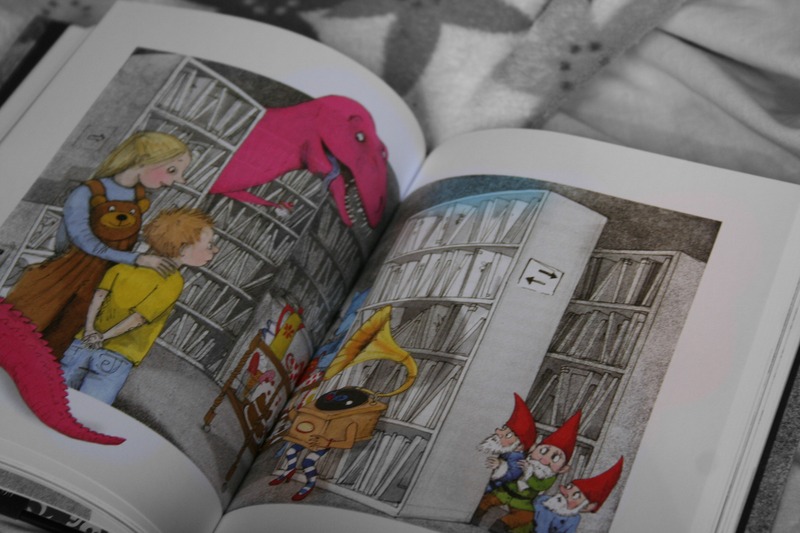 I hadn’t seen any of Emily Gravett’s work before but after The Imaginary I’d love to read more MG books with her illustrations! Overall, The Imaginary was a really stunning book and definitely exceeded my expectations. As soon as I’d started it, I didn’t want to stop reading – and as soon as I’d finished it, I wanted to flip back to the start to read it again! 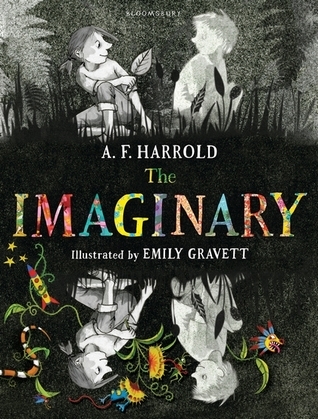 A F Harrold’s writing was fantastic; it’s sad, sinister, unforgettable and magical-feeling all at once – perhaps a little nostalgic too for everyone who’s had an imaginary friend. I really recommend Harrold & Gravett’s book – whether you’re an MG reader or older, looking for a very beautiful and captivating book. I received a copy of The Imaginary from the publisher, in exchange for a review. In no way at all did this affect my thoughts. This entry was posted in Uncategorized and tagged 2014 release, a f harrold, adventure, arc, book review, children's fiction, contemporary, emily gravett, imaginary, MG, middle grade, the imaginary on November 20, 2014 by keithbwalters. Published September 2014 by Doubleday books. Goodreads Synopsis: From NEW YORK TIMES best-selling authors Holly Black and Cassandra Clare comes a riveting new series that defies what you think you know about the world of magic. I started The Iron Trial really excitedly. I’m a big fan of both Cassandra Clare and Holly Black, so I thought that both of them collaborating on a book was a brilliant idea! For the first half of the book, though, I did struggle to get into the story… I definitely had a few issues with the story but towards the end I did enjoyit. I did really like the characters- namely Call, who’s the main protagonist. As this is an MG book, and the start of a series, I think lots of younger readers are going to grow up loving him and the rest of the students at the Magisterium. I grew to really enjoy Magisterium, but, mainly for the first half, there were so many points where I got agitated by it. I just found so many parallels to Harry Potter – wizards hiding in plain sight in an ordinary world, secret school, trio of kids (on the front cover) who look a little too much like Harry, Ron and Hermione… yup. (I know the themes are in lots of books, but still…) There were some really great plot twists, mainly towards the end, that made me grow to love the story a lot more, but for the first couple of hundred pages, I was a bit disappointed, because of the similarities. Okay, ignoring the negative aspects for now; I really did loved the writing! I enjoy Cassie’s writing and adore Holly Black’s, so the two put together was just awesome. They’ve adapted their voices really well for an MG audience, I think. I will probably carry on reading the Magisterium series, as I love their joined writing style. Overall, I did enjoy Magisterium, but it definitely didn’t live up to what I’d expected. 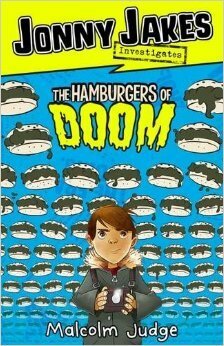 The writing was superb and will definitely draw readers in, but the storyline didn’t do the same for me. 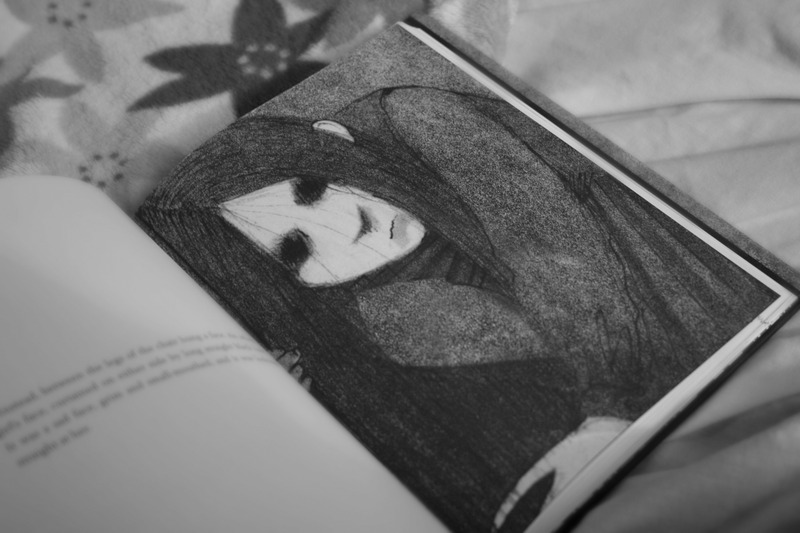 I think, growing up with Harry Potter, I’m a little protective of it, so I just disliked reading a very similar story. However, after the twists at the end, I hope that the rest of the series will have a more original sound – I’m sure I’ll be making time for the sequel when it comes out! 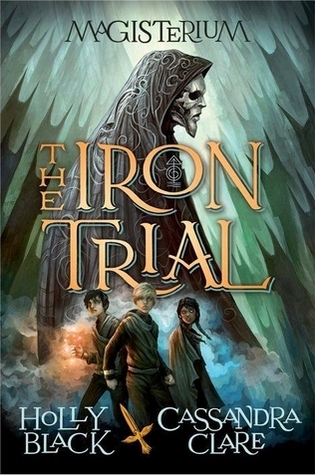 I received a copy of Magisterium: The Iron Trial from the publisher, in exchange for a review. In no way at all did this affect my thoughts. This entry was posted in Uncategorized and tagged 2014 release, cassandra clare, children's book, children's fiction, fantasy, holly black, magic, magisterium, MG, middle grade, random house, review, series, urban fantasy on August 4, 2014 by keithbwalters. 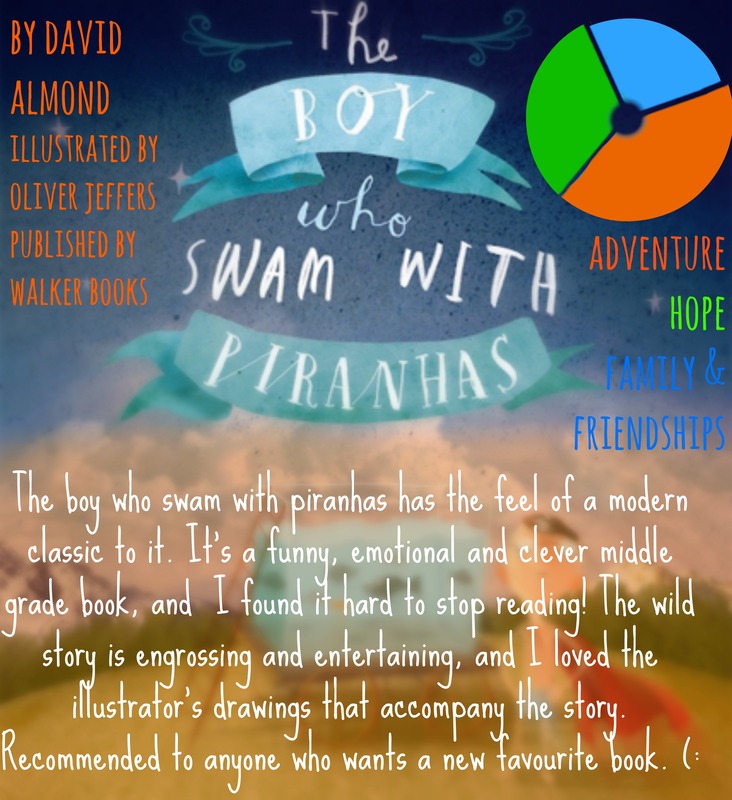 This entry was posted in Uncategorized and tagged children's fiction, fairground, MG, middle grade, modern classic, piranhas on May 12, 2014 by keithbwalters.